The Daylight LED Slimline Table Lamp is flexible, practical, and stylish too — a perfect light source for artists, crafters, designers, and photographers. This super slim brushed chrome lamp features 80 ultra bright Daylight LEDs, which use only 5W of energy but emit the equivalent of 155W of light — an eco-friendly energy reduction of 90% when compared to incandescent bulbs. Daylight LEDs also reduce eye strain and glare, promote healthier vision, and allow for true color matching and color correction when painting or looking at photographs. 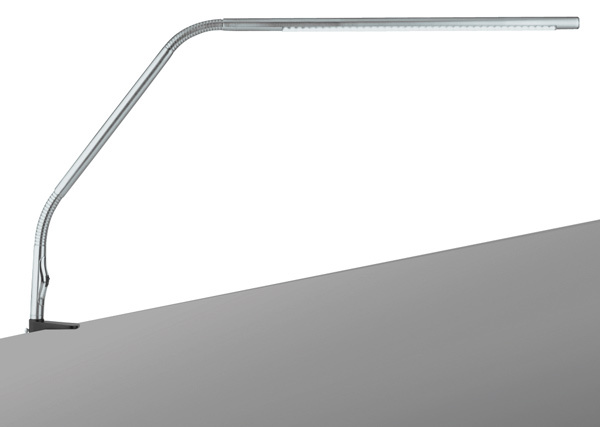 With a 35" flexible arm, the Slimline provides the wide, even illumination that's ideal for large work surfaces. The 360° rotatable shade makes it simple to get the right angle on your project. Attach it to your work table, easel, or chair with the metal clamp base.